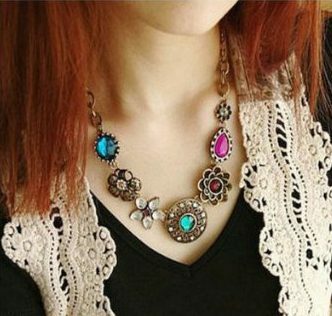 Crystal Flowers Bib Statement Necklace Just $3.33 SHIPPED! You are here: Home / Great Deals / Amazon Deals / Crystal Flowers Bib Statement Necklace Just $3.33 SHIPPED! OK, you guys, check out this GORGEOUS necklace I found! Right now, you can grab this really pretty Crystal Flowers Bib Statement Necklace for only $3.33 SHIPPED! This one is SO pretty with all the flowers and colors – I’m totally grabbing it!